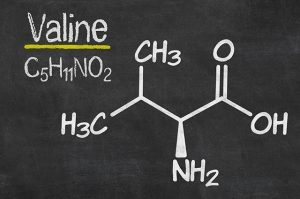 Valine is one of three branched-chain amino acids (BCAAs) — apart from leucine and isoleucine — which bodybuilders supplement themselves with to promote muscle mass and gain. These BCAAs are unique from their siblings in their structure and function. Apart from being necessary for protein synthesis, BCAAs repair tissues and regulate the immune system. Those familiar with organic chemistry will pay special attention to the incredibly stable organization of the valine compound, showing a canonical SMILES (simplified molecular-input line-entry system) of CC(C)C(C(=O)O)N. This is a beautiful string that exhibits valine’s strength and usefulness in healthy muscle function. This specific BCAA was isolated by German chemist, Emil Fischer, from casein in 1901. As a BCAA, valine prevents the breakdown of muscle and provides damaged tissue cells with an additional supply of glucose which is needed for energy production, especially during intense physical activity. In other words, valine allows bodybuilders to engage in their sport longer and with increased focus. The amino acid likewise reduces the recovery period, as muscle tissues need less time to recuperate and knit themselves back together. Recall that exercise is a catabolic activity. This means that it breaks down molecules to release energy as an anabolic reaction. An inevitable result of such a process is that muscles become leaner as it uses protein. Regular and intense activity further liberates muscles of amino acids. As such, bodybuilders may find themselves not only losing weight but muscle too. To prevent this, people are often told to supplement their protein shakes (which promote protein synthesis) with BCAA supplements as well (which replenish lost amino acids necessary for muscle repair). Valine, when taken with leucine and isoleucine, stops muscle from degenerating after a session of strenuous exercise. While each BCAA plays a specific role in muscle function, valine works by providing starving muscles with an extra set of glucose. This also reduces the risk of muscle fatigue. Valine serves an additional purpose of removing toxins from the body, specifically excess nitrogen. This makes the amino acid useful to prevent the onset of various gastrointestinal conditions such as liver disease or alcohol- and drug abuse-induced organ failure. Some medical reviews have stated valine’s potential in reducing alcohol-related brain damage. Valine prevents muscle loss and contributes to the healing process of wounds. As it improves physical strength and adjusts the nitrogen levels in the body, it can be considered an efficient agent for immune system health. The amino acid is highly recommended to support gallbladder and liver health. Valine carries the ability to correct an amino acid deficiency caused by drug addiction or alcoholism. Some studies point to data that state that consuming foods rich in BCAA can restore cognitive abilities. Doctors believe that valine may augment treatments for traumatic brain injuries. What Foods Are High in Amino Acids? Are Your Kids Getting Enough Protein? Valine is one of three BCAAs. These unique amino acids are used by bodybuilders to supplement their routine and prevent excessive muscle loss. Valine is even prescribed to treat conditions related to drug or alcohol abuse.